This photo of H5 at Hillwood Strawberry Farm is kindly provided by Stuart Dix. 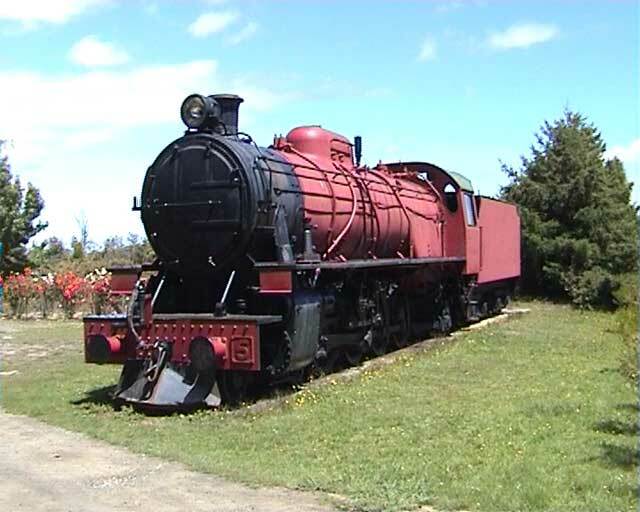 H5 was purchased privately and placed on display at the Hillwood Strawberry Farm, a tourist attraction in the Launceston area. Here it stayed for the next 28 years until 2007, by which stage it was apparently no longer wanted at Hillwood. Fortunately the Derwent Valley Railway stepped in and members quickly raised the funds to purchase H5 and transport it to their New Norfolk base, where it arrived on 15 December 2007 and remains in safe storage. a Dix, A., Beck, D., and Dix M. 'Locomotives of the Tasmanian Transport Museum Glenorchy Tasmania', published by the Tasmanian Transport Museum Society, October 1991.
b Cooper, G & Goss, G 'Tasmanian Railways 1871 - 1996, 125 Years - A Pictorial History' published by C G publishing Company. c Information provided by Melanie Dennis via email dated 14 July 2004.